This article looks at the main respiratory hazards associated with working in the construction industry, and how to stay protected against them. In the hustle and bustle of daily life, it is sometimes easy to overlook the magnitude of architectural progression over time. In many cities throughout Europe, one can see ancient ruins side by side with contemporary, modernist architecture; the juxtaposition is a testament to the inventiveness of man. The Kunsthauz Graz in Austria, the Pompidou Centre in Paris and the Guggenheim Museum in Bilbao all serve as visual exemplification of advancements in building techniques, further pushing the boundaries of what is possible in construction and engineering. However, it is through the crucial manpower of construction workers and tradespeople that these buildings can become manifest. Construction can be dangerous, and it is no secret that the industry has its fair share of occupational hazards. According to the HSE, 80,000 workers in the UK alone suffer from some sort of work-related illness each year – including bodily injury and sickness. While the threat of falls from height, accidents involving machinery and vehicles are very real, perhaps the most dangerous and longterm occupational hazard workers face is respiratory illness. Although reforms and advancements in proper safety equipment are helping to keep workers safer, threats of illness are still quite prevalent. The process of building can set forth obstacles for workers. Techniques such as sandblasting, welding, and painting are necessary for many jobs, but can subject labourers to serious illness. Obstructive Pulmonary Disease, most commonly known as COPD, is a comprehensive term used to describe a number of different respiratory ailments. The most common illnesses that fall under the COPD nomenclature are chronic bronchitis and emphysema. Most cases of the disease, however, are characterised by poor airflow, difficulty breathing, and chronic coughing. COPD is known to be a progressive disease, and patients can expect breathing to become more and more laboured as the years progress. Smoking is the number one cause of COPD, but fumes and construction dust exposure can significantly increase one’s chance of contracting the illness. To best comprehend how COPD affects the lungs, it is best to gain a basic understanding of how the pulmonary system functions. The lungs’ primary function is to withdraw oxygen from the atmosphere to drive into the bloodstream, where respiration occurs, and results in exhalation of carbon dioxide. This happens by inhaling, where the air drawn flows through one’s bronchial tubes. After, the air moves even further to the bronchioles, and finally, the alveoli; small air sacs at the end of the tube. In a lung affected by COPD, heavy scarring of the alveoli occurs, which deeply inhibits breathing. As the alveoli become damaged, the gas exchange in the lungs reduces and breathing troubles extensively develop. According to a Danish study in 2017, 15% to 20% of prevalent cases of COPD have been attributed to “exposure to vapours, gases, dust, and fumes.” The study was performed over the course of 16 years, where patients were methodically selected through medical databases. Throughout the assessment, a risk estimate was undertaken to determine the incidence of COPD and comorbidity with other airway obstructive factors. Out of 12 studies, nine were found to have a “statistically significant association between COPD and work in the construction industry.” While the study cannot draw any definitive conclusions, it was determined that COPD certainly appears more often in construction workers. Potential substances on the jobsite that may contribute to COPD include cadmium (both in dust and fume forms), grain and flour dust, mineral dust – including organic and silica dusts, and welding fumes. Duties that may be considered for susceptible exposure are agricultural workers, masons, quarrymen, and foundry workers – along with general construction labourers. 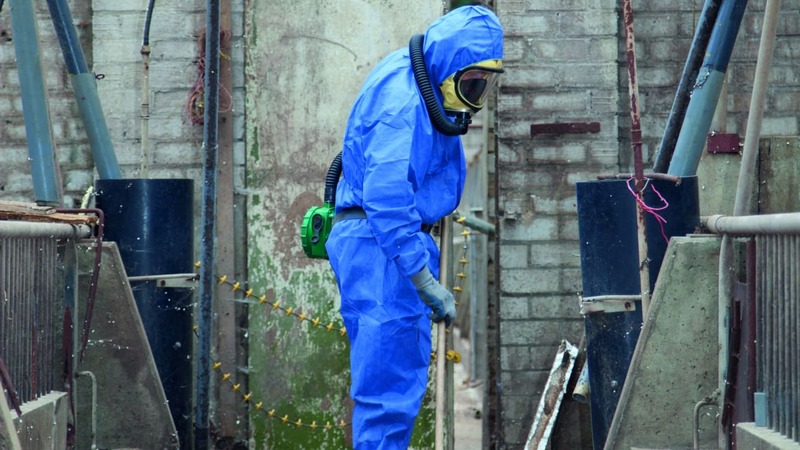 Very few building materials have a legacy quite like asbestos. Before the naturally-occurring silicate mineral had its fall from grace in the late 20th Century, it was admired for its strength, durability, and fire resistance – it was used in just about everything. From crock pots to children’s toys, asbestos was seen as a quality fortifier in many instances, but its real prevalence was in the industrial sector. The material is almost certain to be found in buildings constructed prior to the 1980s, particularly in insulation, tiling, roofing, and electrical applications. The factor that makes asbestos very dangerous is the material’s propensity to fragment and splinter, a quality known as friability. When the material breaks apart, it can form a fine dust that can easily be inhaled. Instances where this could happen include demolition and remodelling jobs, especially indoors. Workers who inhale this particulate dust run the risk of developing serious illness, including mesothelioma – a rare cancer solely attributed to asbestos exposure. This occurs due to the body’s inability to dispose of the asbestos matter, and once inhaled, the material embeds itself within the body. The material will lie dormant for years in the body, where it can significantly alter cellular function and cause troublesome health effects. Mesothelioma cancer is by-and-large the most serious health detriment attributed to asbestos exposure. The illness most commonly affects the lining of the lungs – a layer known as the mesothelium – but, in rare cases, can also occur in the lining of the heart or stomach. These conditions are known as pleural, pericardial, and peritoneal, respectively. The most common symptoms of the disease include chest pain and tightness, shortness of breath, a recurrent cough, and fluid buildup in the lungs. Once diagnosed, patients face a dubious outlook, as life expectancy rates are between 12 and 21 months. Common places to find asbestos are in homes and commercial buildings constructed before the 1990s. Whereas vermiculite insulation in the United States is a known source of contaminated material (as it was fortified with asbestos), vermiculite in Europe was heavily regulated and tested. However, chrysotile asbestos can be found prevalent in insulation, especially in walls and encasing old boilers and heaters. Roofers, contractors in remodelling and demolition, and painters run a higher risk of asbestos exposure due to the nature of their work. Silica is the second most-prevalent element found in the Earth’s crust after oxygen, and can be found throughout the world. Chemically referred to as silicon dioxide (SiO2), silica is the primary component of quartz, sandstone, and granite. In the construction industry, particularly within grinding, sandblasting, and masonry, a great deal of dust can be created throughout the process. While different forms of silica exist, the most common type is known as amorphous silica, which can be found in electronics, hydraulic fracturing and cement composition. The mineral can also be found widespread in consumer goods, such as personal care items, pharmaceuticals, food, and glass. Silica dust can wreak havoc on the respiratory system of construction workers, due to its susceptibility for inadvertent inhalation. The prevalence of the mineral in both man-made and natural materials makes the substance almost unavoidable. Workers who are responsible for sandblasting are by far the most at-risk demographic, as they directly cause the release of silica dust through their work. The most dangerous aspect of silica dust exposure is the threat of developing silicosis, a lung disease characterised by breathing issues and chronic coughing. Similar to COPD, silicosis greatly inhibits the lungs’ ability to function. With silicosis, however, the lungs are unable to clear themselves of the dust that begins to envelop components internally, and thus accumulation of silica in the lungs complicates their function. The symptoms of silicosis are primarily laboured breathing. Also, wheezing, shortness of breath, and a severe cough may be present as well. The condition can also be exacerbated by comorbid conditions such as tuberculosis or bronchitis, and can be worsened by tobacco smoke. Volatile Organic Compounds, known as VOCs, can greatly affect workers’ health in the construction and industrial sectors. They are defined by the European Union as, “any organic compound having an initial boiling point less than or equal to 250°C (482°F) measured at a standard atmospheric pressure of 101.3 kPa.” These carbon-based chemicals are known to irritate the airways of workers, causing short and long-term health effects. Some examples of jobs that may come into contact with these agents are welding, painting/paint removal, and work with adhesives. While VOCs have not been directly linked to any form of cancer, they can exacerbate pre-existing conditions, including asthma and COPD. Furthermore, the advent of work-related asthma, which is characterised by the narrowing of the airways from inflammation, can arise from chronic exposure to volatile organic chemicals. Some of examples of common VOCs include benzene, ethylene glycol, and formaldehyde; they can be found in paints and varnishes, foams, and composite wood materials. Working conditions in the construction and industrial sectors can certainly result in volatile air quality conditions, but when workers exercise caution on the jobsite the risk of illness and disease becomes greatly reduced. It is imperative that workers in any role that involves the creation of particulate matter, such as demolition, jackhammering, or sandblasting always wear calibrated respirators, with the corresponding assigned protection factor. Furthermore, being aware of the risks in home remodels, such as assuming homes constructed prior to 1990 may contain asbestos or lead-based paint, can help prepare workers to properly protect themselves. Project managers and foremen have a responsibility as well to keep their workers safe. The usage of personal protective equipment (PPE) should always be common practice. The introduction of proper ventilation to particularly volatile areas, such as indoor areas with drying paint or varnish, or heavily dusted areas, can greatly reduce the chance of exposure. When these safety practices are implemented and strictly adhered to, workers can perform their duties at their very best and look forward to the next project to come.